3#. Training/Chapter Simulator for training Co. and none profit organizations: If you are a training company or a none profit organization, nothing is more effective boost to a carrer than mastering the project management skills and pass PMP exam to get PMP designationfrom PMI, here is why you should book meeting with us to customize to best fit your organization goal of helping members personal and carrer development video: https://www.youtube.com/watch?v=IYz3LLTuixU The sample Partner is offering PMP exam training. 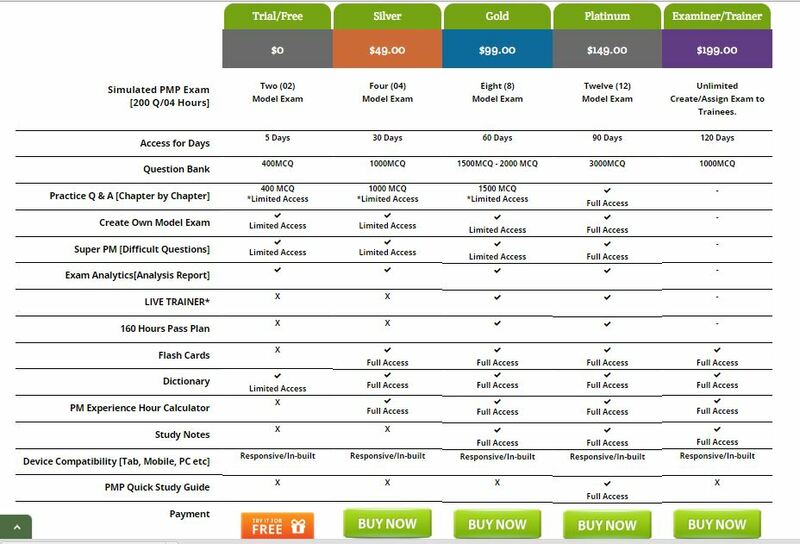 Here is The comparison of the 5 packs of simulators to help you or your friends to pass PMP exam. If it is not for you, please read on to help your friends who need this for a cutting edge career advancement. Please go to the above links to choose the right one for you to click for registration. 1. Go to the registration link. 2. Fill up the form. It will lead you to the payment gateway. 3. You will get a confirmation email and your account will be activated within few hours. TO YOU OR YOUR FRIENDS SUCCESS!